The iPod Touch 3G is very similar in style to the originals. It features the same design, it has a home button, power button, volume buttons on the side, and a large screen. These are features to the device that can actually develop problems and need repairs as well. The volume buttons, home button, and power button can get stuck. If this happens, you will need a company to provide repair services for you, so that these features of the phone can be repaired. Additionally, screen replacement services are often needed if the screen has become damaged or completely broken. 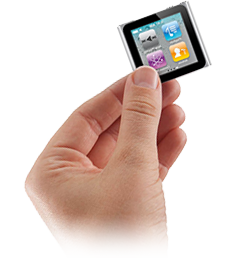 At The iPod Repair Centre, we can replace your screen with a fresh one that looks brand-new from the factory. Select this repair if your internal lcd screen on your iPod touch is not working properly or is damaged and needs replacement. Probably the most common fault is the broken glass digitizer. Please select this repair if you have cracked or broken your external touchscreen. This repair includes a brand new original glass digitizer replacement. Probably the most common fault on the iPod is the broken glass digitizer. Please select this repair if you have cracked or broken your external touchscreen. This repair includes a brand new original glass digitizer replacement. This repair is for the cleaning of liquid damage on your iPod Touch. It covers the cleaning of the main board and the replacement of damaged main board components ( it does not include price of parts such as speaker, touchpad, lcd screen etc. Select this repair if the back cover of your iPod Touch is scratched or damaged and you want a brand new one fitted. Please select this repair if you are having issues with the sound coming from the headphone socket of your apple iPod. This is another one of the common repairs for the iPod Touch series. Symptoms include loss of sound from one channel, crackling sound or no sound at all from the headphone socket. Please select this repair if your iPod Touch no longer syncs with iTunes or you have damaged the pins on the bottom connector of your iPod Touch - 3rd Generation. Select this repair if your unit is completely dead and not showing any signs of life. We will try our best to recover it for you. Select this repair if your iPod no longer holds its charge like it used to. Please select this repair if your iPod is freezing or not behaving the way it should. This is usually remedied by a software upgrade. Please note - all personal information and music, videos etc will be erased. Select this repair if the home button on your iPod Touch - 3rd gen is not functioning correctly or is not working at all. Select this repair if your Touch power button is no longer functioning correctly. You can also select this repair if your iPhone 3G power button is stuck or missing.